Miss Kelly : Where Can I Get a Kanga Like That? nnoticed by most people, President Bush has truly changed the US engagement with African nations. He's visited it more than any other president. He's funded successful AIDS and malaria programs at levels higher than any previous administration or other European nations. He's promoted good governance, tying financial aid and trade packages with African nations that promote the democracy and the rule of law and that encourage economic freedom. Now if we could just reduce or do away with those tariffs on imported cotton, we'd really open up trade with African farmers. "Mr. Geldof praised Mr. Bush for his work in delivering billions to fight disease and poverty in Africa, and blasted the U.S. press for ignoring the achievement." "Mr. Bush, said Mr. Geldof, 'has done more than any other president so far. This is the triumph of American policy really,' he said. 'It was probably unexpected of the man. It was expected of the nation, but not of the man, but both rose to the occasion. What's in it for [Mr. Bush]? Absolutely nothing,' Mr. Geldof said. " "Mr. Geldof said that the president has failed 'to articulate this to Americans' but said he is also 'pissed off' at the press for their failure to report on this good news story. 'You guys didn't pay attention,' Geldof said to a group of reporters from all the major newspapers." Bob Geldof should know why Bush is doing this, even though there's nothing in it for him. It's Bush's Christianity that's powering these programs. Bush has failed to articulate? Unfortunately, he's failed to articulate much of anything about what he's doing and why, most obviously on Iraq for years now. 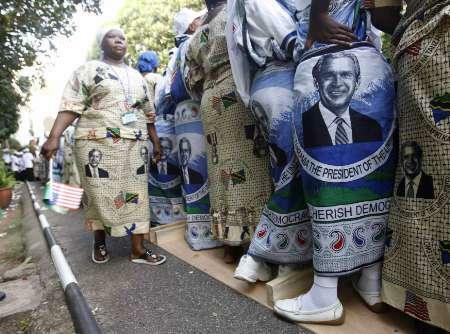 Anyways, kudos to the Bushes on their African tour. Soon enough, we won't have George Bush to mock and deride anymore. But the profoundly different way he's engaged the US with other countries, especially in the Middle East and Africa, his unabashed commitment to spreading democracy, will be an enduring legacy. Kissinger is right, I think. History will look back quite postively on Bush's presidency. Info from the White House on his February 2008 Africa trip here.